Cleveland Cyclewerks bikes are made in Asia, which an issue for some looking closely at the brand. Like many Midwestern cities, Cleveland, Ohio, has struggled in recent years with its post-industrial identity. However, on the shores of Lake Erie, a new motorcycle company has emerged out of the ashes of an old rubber factory. “We are Cleveland” is its motto. Cleveland Cyclewerks was a dream project for Colosimo, who has a degree in automotive design from the Cleveland Institute of Art. After graduating, he found the transition from school to the automotive industry was not what he expected. When the economy took a nosedive in 2008 and he was laid off, Colosimo knew he couldn’t go back to a corporate job. After years of filling sketchbooks with designs and constantly tinkering and customizing motorcycles in his garage, he shared his unique idea for a new motorcycle company with a former colleague, Jarrod Streng. Colosimo’s “back of the napkin” vision for a small to mid-sized bike brand with affordable price tags impressed Streng so much that the two of them went into business the very next day. The company was founded on a design aesthetic that was the opposite of the big, loud, heavy and expensive bikes most Americans prefer. Colosimo’s simple, retro-inspired designs were different and took direct inspiration from his hometown. At the heart of this ambitious new company was the idea of bringing manufacturing back to Cleveland. Colosimo and Streng knew they would never be able to set up shop like a traditional motorcycle or car manufacturer. As newcomers to the field, their business plan called for finding local partners to help the company get started and grow. Could Shoring Be the Answer to Bringing American Jobs Back? The door shut in their face again and again. So they decided that the goal of getting the bike made trumped the goal of making it in the United States-- at least in the short term. The experience turned out to be a sobering lesson in manufacturing a product overseas versus making it in America. “The one thing that was absolutely amazing to me was nobody said ‘no,’” says Colosimo. “Every single factory that I went to in China, they didn't ask me my age. They didn't care how old I was. They looked at the idea for what it was and they said, ‘How many? How long?’"
As it turned out, manufacturers in the United States were not relating to the product. In Asia, small motorbikes outnumber cars, and demand is high. Suddenly, it seemed obvious to Colosimo and Streng that they should make and sell their bikes there. They set out to get some traction in Asia, and decided to worry about the American market later. The irony of a bike with a brand name like Cleveland Cyclewerks being made in Asia is still an issue for some looking closely at the brand. However, Colosimo has carefully thought through his position on this. “If you look at what people would typically consider the American motorcycle, they would be shocked at the [amount of] content that is not made here, because it's significant,” says Colosimo. Colosimo and Streng have created a modern international business with the design, development, and engineering done in Cleveland and most of the manufacturing done in Asia, closer to their largest customer base. Now, after making tens of thousands of bikes and earning a good reputation in the industry, Cleveland Cyclewerks is finally getting back to their original plan of bringing some of the bike manufacturing and assembly to America. Streng and Colosimo are proud of their ability to provide jobs in the United States and beyond. Cleveland Cyclewerks founder Scott Colosimo hopes to bring manufacturing back to the American midwest. Now, as they approach their tenth year in business, it may be a bigger milestone than they ever expected. “Somebody told us that once we reach our 10-year anniversary, we'll have been the first motorcycle company in the U.S. in the last 50 years to have started and had the staying power as a brand that we've been able to achieve,” says Streng. 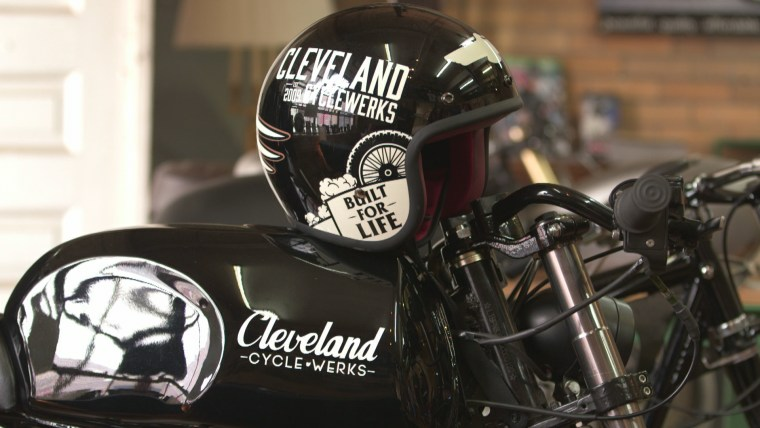 After a lot of blood, sweat, and tears — and surviving so long in a tough industry — Cleveland Cyclewerks seems to have worked out the kinks and created a brand that is here to stay.